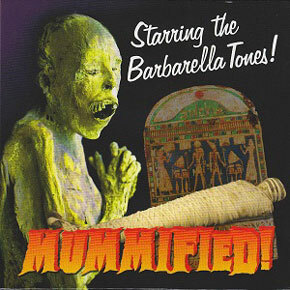 Still exploring the strangest sides of sci-fi and B-movie culture, Robbie Quine and friends are getting mummified on this new album! Opening song “Goth Hippy” sets a dark psychedelic mood right from the start, just as the title of the song suggests. From Rocky Horror BOWIE-esque touches (“Teenage Creepazoid”, “Donut Shop”, “Mummified”) to CRAMPS meet death rock moments (“Night of The Monsters”, “Feminine Products”), The BARBARELLATONES are still rocking with their spooky sense of humor, cryptic beats, 70s melodies, and it’s hard not to dance on songs like “Va Va Voom”, “Sharknado” or “Pee Pee Cup.” The spirit of the STONES isn’t far when listening to “Truckstop Angel” or “The Right Thing To Do”, and images from Phantom of The Paradise come to mind as soon as “Then The Sausage” starts. Gothabilly, psych-glam, sci-fi surf’n’roll, The BARBARELLATONES still deliver their unique mix of influences in the most unexpected ways. The BARBARELLATONES never disappoint./Laurent C.